[…] Lazarus didn’t play a part in his resurrection. How could he have done, since he was already in the grave? Christ raised Him because that is what He Himself wished. Zacchaeus, however, worked hard for his resurrection. It started with an intense desire to encounter Christ, having first heard that, at least, He was somebody who wasn’t prejudiced against sinners. He cared nothing for the comments- perhaps the mockery- of the crowd when, because of the crush and because he was short of stature, he climbed up into a sycamore to see Christ. And something even more costly to himself: he imposed upon himself what are perhaps the harshest conditions in the history of human economics, when he saw the crowd complaining about that fact that Christ not merely turned to look at him, but called him by name and asked to be put up at his house. These conditions included giving half his wealth to the poor and the four-fold restitution of any ill-gotten gains. 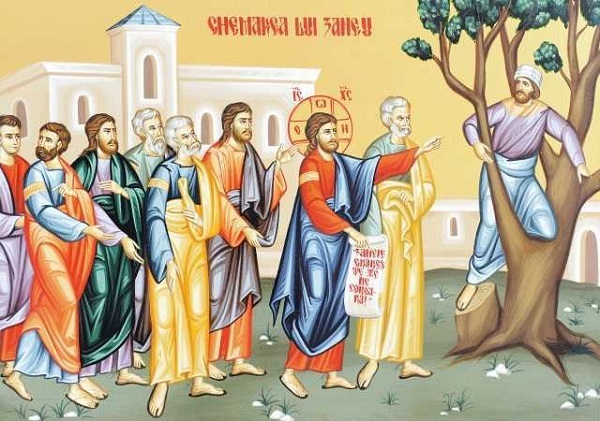 This really radical elimination of the passion of avarice was the fruit of Zacchaeus’ spiritual resurrection and testimony to the force of his repentance. How was it possible for a man so dependent on the love of money that he wouldn’t hesitate to oppress others, a man who was so callous, to cross from death, which is sin, into the life in Christ? God saves us neither by magic nor by force. He awaits, on the one hand, our invitation; and, on the other, our staunch repentance. Saint Makarios the Egyptian says that no matter how devastated our souls are through our passions, no matter how listless we’ve become, we still have the chance to seek the real Doctor, just as an infant which has yet to take its first steps can still ‘crawl and call and cry’ for its mother ‘in pain and howling’, even though it can’t walk to her. So Zacchaeus was seeking a ‘maternal’ hug. Or, rather, he was seeking the embrace of Christ, which is even warmer than the hug of a mother. He Himself said that even if a woman were to forget her children, He would not forget us (see Is. 49, 15). This is why the chief tax-collector scrambled up a sycamore tree, like a little child: so that the silent cry of his pained soul could be heard all the louder. Demonstrating that, essentially, He’d come to Jericho just for him, He said: ‘Zacchaeus, come down quickly. Today I have to stay at your house’. In other words, he was saying: ‘You’ve opened the door of your heart to me. That’s the main thing. Without that response, I couldn’t save you. I need this cooperation. That’s the hand you’ve lifted up so that I can hold on to you and raise you. For Me, that’s an invitation to come into your home. And, finally, when we get there, you won’t serve me, but “I will gird myself, have you recline to eat and will come and serve you” (Luke 12, 37). Today, I’ve brought salvation to this house. This is why I came into the world: to seek my lost sheep and save them’. In John’s Revelation, the Spirit of God says: ‘Blessed and holy are they who have a share in the first resurrection; over them the second death has no authority’. In other words, the second death, the final separation from God on the part of the unrepentant, at the Second Coming, won’t threaten any of those who’ve struggled valiantly and staunchly here and now for their ‘first resurrection’ in Christ. The resurrection resulting from their continuous repentance. This is part of a longer article by Fr. Varnavas entitled ‘Ἡ πρώτη Ἀνάσταση’ (‘The First Resurrection’).